Powers/Abilities: The Haalmhad are a race of humanoid aliens whose external appearance is identical to that of Caucasian humans from Earth. They are not known to possess any superhuman powers or abilities. Cultural Traits: The Haalmhad are a self-righteous race who, believing that they are good people, have taken it upon themselves to impose their views on the various alien species who inhabit the scattered worlds located in the galactic rim where their homeship has roamed for generations. The Haalmhad are also a very democratic race, with each member of their community having a vote in decisions about what actions they will take. Unfortunately, a majority of the Haalmhad are also very concerned about potential threats to the survival of their race. This concern is so extreme that the Haalmhad have destroyed entire worlds that they have only perceived as possibly being a threat. As for the minority of the Haalmhad who voted against destroying the K'yndarii, they were fervent in their desire to not become the "greatest mass murderers in galactic history" but, aside from voting against the destruction, they did not take any actions to prevent it. Level of technology: Superior to Earth, with an immense interstellar spacecraft capable of faster-than-light travel, energy beam weaponry, fission nukes and fusion bombs. They also have a number of smaller fighter craft called Starhawks. History: Nothing has been revealed about the past of the Haalmhad prior to their existence aboard their homeship. Presumably they evolved on some planet but where that world is (or was) located has never been revealed. Similarly, nothing is known about the circumstances which caused them to leave their homeworld. (Marvel Preview#15 (fb) - BTS) - For countless generations, the Haalmhad homeship has roamed the galactic rim, trading knowledge and technology for the raw materials that they needed to survive. Perceiving themselves as good people, the Haalmhad have imposed their word as law upon the alien races inhabiting the scattered rim worlds. For a long time, the Haalmhad did not consider the interplanetary culture of the K'yndarii to be a danger to them. However, when they learned that the K'yndarii had allied with the interstellar Ben'yr Federation, the Haalmhad began to perceive them as a threat to their survival. A ship-wide debate began in which every member of the Haalmhad community listened, commented, argued, and made up his or her mind. Then a vote was held at which a majority, led by Commander Caine, decided that the K'yndarii were a threat that had to be elminated...by destroying not only the K'yndarii but also the planets which they inhabited (so that their resources could not one day be used against the Haalmhad). (Marvel Preview#15 (fb) - BTS) - When the Haalmhad homeship arrived in the K'yndar system, the K'yndarii welcomed them, believing that the Haalmhad would greet them as friends. The Haalmhad refused to acknowledge the K'ynadrii's radio transmissions, a choice which prevented any attempts to surrender. As the Haalmhad worldship began its weeks-long approach, the K'yndarii High Command began to gather every ship they had to serve as outer defenses for Kyndar IV (called Carillon by its inhabitants) in an attempt to stop the Haalmhad. (Marvel Preview#15) - On "Monday morning" the Haalmhad began their attack on Carillon. Although opposed by every ship that Carillon had, the Haalmhad Starhawks smashed through Carillon's outer defenses as if they didn't exist and in a matter of hours local planetary vectors were theirs to command. Only one K'yndarii pilot is known to have survived the battle. The Haalmhad hadn't expected much opposition from any ground-based installations and so their forces suffered many losses when their first assault wave was cut to pieces by massed batteries of laser cannon. Despite this setback, the Haalmhad recovered quickly and began neutralizing the ground bases one by one using lasers or tactical fission nukes or strategic fusion nukes. Eventually, all military targets were destroyed and the Haalmhad gunships began targetting Carillon's cities. Megaton air bursts reduced city towers to piles of rubble and produced miles-high clouds of smoke and dust that, when morning came, blocked most of the light from the K'yndar system's sun. Of the people of Carillon, the lucky ones died in the initial blasts or in the firestorms which followed. Others lived long enough to know pain. And those who appeared untouched by the bombardments were doomed anyway since their bodies were being consumed from within by radiation poisoning. "Primary sensor scan indicates destruction of 98.73% of all military objectives, 92.41% of techno/industrial centers, 97.81% of population centers. Sensors further indicate massive surface and atmospheric ionization; radiation levels far exceed acceptable tolerances for indigenous humanoid life forms. Extensive ground and marine contamination. Mean surface temperature increasing. Also indications of considerable tectonic activity. Bio-analysis indicates minimal probability for survival of any life form above basic protoplasmic levels." 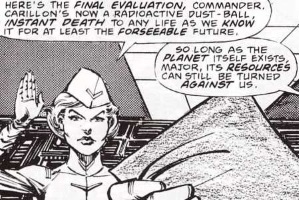 The major then gave this final evaluation: "Carillon's now a radioactive dust-ball, instant death to any life as we know it for at least the foreseeable future." However, Commander Caine then stated his view that, as long as the planet itself still existed, its resources could still be used against them, and so he gave the order to the Weapons Deck to open fire on their target coordinates. In response, multi-tiered turrets deployed and simultaneously fired a single salvo of huge energy beams which burnt deep into Carillon's crust, cutting along the planet's natural geological fault lines. As a result, Carillon's internal forces were released and the planet almost instantaneously exploded into rubble. (Marvel Preview#15 (fb) - BTS) - Unknown to the Haalmhad, the sensors of the sentient starship known as Ship had detected the destruction of Carillon. Due to the strong empathic rapport between him and Ship, Star-Lord exerienced that destruction as a nightmare while he slept. (Marvel Preview#15 - BTS) - After the destruction of Carillon, the Haalmhad put their homeship on an intercept course for Cymoril, a course that would have the homeship loop over the system's sun, above the plane of the ecliptic. They would be in range of Cymoril by (that planet's) next morning and begin their atttack later that day. (Marvel Preview#15) - While on course for Cymoril, the Haalmhad resumed their ship-wide debate about how to deal with the K'yndarii threat. The officer representing the majority viewpoint argued that the K'yndarii had become dangerous when they allied with the Ben'yr Federation and that that danger had to be eliminated. Doctor Panshin countered with the fact that the K'yndarii had done nothing to the Haalmhad and asked if their people were so spiritually bankrupt that they had to become the greatest mass murderers in galactic history because of a threat which might not even exist. Having heard enough, the officer reminded Panshin that a community decision had been made before they had "neutralized" K'yndar IV and asked if Panshin had sufficient support to overturn that vote. When Panshin admitted that he did not, the officer stated that further debate was pointless and the final phase of their operation would proceed as scheduled. (Marvel Preview#15 - BTS) - Later, while still on course for Cymoril, a security board reported unauthorized activity at an emergency airlock in a remote part of the homeship. Soon after that, a squad of combat troopers (in full battle armor) found Major Stanchek, whose unconscious body had been hidden by the alien intruder who had taken his uniform and credit card. Security comps were alerted to watch for any activity by "Major Stanchek." (Marvel Preview#15) - On the command deck, sensors detected a contact that was closing fast on an intercept course. The contact refused to answer the homeship's hails and the computer was unable to identify its configuration beyond the fact that it was not a K'yndar ship. In response, the battle stations alarm was sounded and within minutes a full flight of Starhawks was launched at maximum acceleration towards the unknown foe. As the alien contact (Ship) was able to easily evade the missiles and energy cannon fired at it by the Starhawks and continue to approach the homeship, that vessel's main batteries began to fire on it as well. 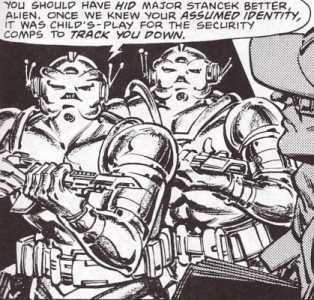 After security comps detected that Major Stanchek's credt card had been used, a squad of four troopers confronted the alien intruder (Star-Lord) near the engineering section. Holding him at blaster-point, they were about to shackle him and take him to be interrogated when he, using their numbers and the close quarters against them, fought his way free and entered the homeship's circuitry systems control room, sealing the hatch behind him. (Marvel Preview#15 - BTS) - Meanwhile, once the alien ship had surrendered, the Haalmhad brought it inboard and secured it in Hangar 1. (Marvel Preview#15) - The troopers managed to burn through the hatch and confront the alien, but he blasted a coolant pipe to creat a dense fog that he was able to use to get away from them. The alien next showed up in Computer Central, interrupting the crew as they were calibrating target coordinates on K'yndar III. The alien inserted a computer program into the system before starting a fire and escaping again. Meanwhile, in Hangar 1, the technicians were attaching sensor leads to the alien ship when the alien intruder was spotted on a balcony above. Before anyone could react, the alien had made it aboard his ship. That ship then announced that anyone in the hangar had one minute to evacuate or they might be harmed, and then began to glow. The crew quickly realized that the ship's hull was heating up and they decided to blow the hangar bay doors and "void that hellship" but discovered that the alien had wrecked all the relevant control systems. As the temperature reached "a thousand Centigrade" and continued to climb, the crew realized that they were watching a controlled matter-to-energy conversion as the ship was becoming a small star. As the temperature continued to climb, Commander Caine ordered that the ship's main screens were to be focused around Hangar 1 with the full output of the matter/anti-matter reactors behind them. In Computer Control, Verdi realized how overload levels on the shields would react with the sabotage the alien had performed on their defensive systems, but he was unable to countermand the order in time. As the alien had planned, the homeship's full power was spread throughout the ship's entire power grid, overloading every system and power line in the starship, effectively reducing it to a billion-plus tons of inert metal. After seconds of darkness, the emergency lights came on. On the bridge, Commander Caine demanded a report, but his subordinate stated that his board was nonfunctional and, based on what he had seen before it had shorted, the failure ran through the entire ship. At that point, the bridge crew heard an an unfamiliar voice state, "You're all as good as dead." Turning towards the voice, they found the alien seated in a command chair. After swivelling to face them, the alien introduced himself as "Your conscience, if you will. Or your executioner." He then identified himself as Star-Lord and claimed responsiblity for what had happened to the homeship. Star-Lord then stated that the K'yndar had offered them friendship but the Haalmhad had chosen to destroy the K'yndar and now they had no choice. Star-Lord then revealed that there was a primitive but livable Type-M planet in a G-3 star system about twenty parsecs away and that, if they were careful, their emergency life support systems would last the time it would take for his ship to tow them there. When the commander asked if he meant to maroon them there, Star-Lord corrected him, stating that it was a quarantine and that at least there they would have a chance for survival, more than they had given the people of Carillon and more than they had in their present situation. Later, while speaking with his companion, Ship, Star-Lord predicted that the Haalmhad would accept his terms, albeit grudgingly and with anger at having been humbled. Whether or not the Haalmhad actually accepted Star-Lord's terms has never been revealed. Comments: Created by Chris Claremont, Carmine Infantino, and Bob Wiacek. The story in Marvel Preview#15 is drawn in black-and-white which makes it difficult to be sure what color skin the Haalmhad are supposed to have. The fact that they are not depicted as grey suggests that their skin color is lighter rather than darker and Star-Lord's ability to infiltrate their homeship without covering his face strongly suggests that their skin color was identical to that of Caucasian humans. Presumably their hair color had a range similar to that of humans as well. Some online sources (wikis) state that the Haalmhad are "the same people who had destroyed Ship's planets back when she was a star." This idea is nonsensical and whoever wrote it clearly has never read (or, at least, not understood) "A Matter of Necessity!" since that story made it clear that Ship's original stellar form and her planets were destroyed "more years (ago) than (the human) race has existed." The only fact that was provided about the size of the homeship was that it was "a hundred kilometers long" so the other dimensions (width and height) will have to be calculated from that length. The story contains three images of the entire homeship but only two of them are useful in detemining size. In the first image the homeship is about 10.5 cm in length by 4 cm in height but its width is uncertain since the way the artist simulated perspective makes the homeship look narrower at its front. In this image, about 6 cm of its length are taken up by the flat "shelf" at the front of the ship which is only 1 mm (0.1 cm) thick. If we take the 10.5 cm to equal 100 kilometers, then the "shelf" is about 57 kilometers long and 0.95 kilometers thick, with the rear of the ship having a height of about 38 kilometers. In the second image the "shelf" portion of the homeship is 9.5 cm long, 6.5 cm wide and just over 1 mm thick. If we compare these measurements with those from the first image and used the calculated dimensions, taking the 9.5 cm length to equal 57 kilometers, then the width would be about 39 kilometers. Taken together, these calculations indicate that the Haalmhad homeship is 100 kilometers long and 39 kilometers wide but it height varies greatly, with a forward section that is 57 kilometers long but less than 1,000 meters high while the rear section (making up 43% of the ship's length) is about 38 kilometers high. All in all, this is a VERY odd design for a starship. The fact that "untold generations" of Haalmhad have lived out their lives on it means that the homeship is an example of a Generation Ship. However, in most fictional continuites such starships are usually only built by races who don't possess any means of faster-than-light travel so any interstellar voyages will take so long that a single generation of crew would age and die before the ships could reach its destinations. The homeship appears to be an atypical generation ship since it apparently is capable of FTL travel and its crew is content to roam the galactic rim without any final destination in mind or plans to colonize any planet. Aside from being a Generation Ship, it's possible that the Haalmhad homeship is also an example of a Interstellar Ark, like that in which the last of Kestorans fled their Negative Zone homeworld before its destruction. Of course, such arks are usually only built when their builders' homeworld is threatened with destruction and since we were never told why the Haalmhad left their home planet it's impossible to conclusively identify the homeship as such an ark. With that in mind, I can't help wondering about exactly why the Haalmhad first chose to live amongst the stars on the homeship. After all, nobody would build such a massive starship unless they had a VERY good reason. And since the story provides no information, we can only speculate. 1. The most obvious reason for the homeship to have been built is that, as mentioned above, it was an Interstellar Ark designed to prevent the Haalmhad race from becoming extinct due to some planetary disaster that destroyed their homeworld or rendered it uninhabitable. The fact that the Haalmhad seem to prefer living in space may be a result of their history making them aware of how fragile life on a planet could be. 2. A second possible reason is that the Haalmhad homeworld was not destroyed but it did come under the control of an alien race. In this case, the homeship would still be an ark but the Haalmhad would be political refugees who were unwilling to live under the control of the aliens and chose to leave their homeworld instead. Granted, the Haalmhad would be considered VERY well-armed for refugeees, but it's not impossible. 3. A third possibility is that the Haalmhad left their original planet of origin because they were a persecuted minority among their own species. Given their self-righteousness and the fact that they are willing to commit genocide against others who challenged them, I can see why they might have become unwelcome on their homeworld. It's also possible that they didn't choose to leave but were forcibly exiled by the rest of their race. Of course, considering that the homeship could single-handedly destroy a planet, one can only wonder how much more destructive these hypothetical other members of their race would be. 4. A final possible reason why the Haalmhad might have left their homeworld is simply that they were obsessed with the very idea of traveling and living among the stars and were totally committed to achieving that goal. Although I would find a more pragmatic reason to be more plausisble I can't dismiss this as being totally impossible but, from what we've seen of the Haalmhad, such a motivation does seem somewhat uncharacteristic. 1. Scientists believe that it is highly unlikely that lifeforms that evolve on different planets could end up with identical physical appearances. 2. Therefore aliens who look like Humans are an example of Bad Science. 3. The presence of Bad Science can negatively affect one's enjoyment of a science fiction story. 4. The effects of Bad Science on a story can be diminished if some sort of plausible explanation is provided for the uncanny similarity in form. 1. An essential plot point is that Star-Lord infiltrated the Haalmhad homeship in order to sabotage it. Obviously, this is something that was only possible because the Haalmhad were humanoids. The alternative course of action, as mentioned several times, was that Ship would simply destroy the homeship (or die trying) which would have resulted in a less interesting story. Of course, I still would have preferred it if the Haalmhad hadn't been SO completely identical to humans. 2. Since Human beings are often the "heroes" in science fiction stories, it is refreshing to have a reminder that just because people look "human" doesn't necessarily mean that they're "humane" in nature. In this case, the Haalmhad, who look like perfectly nice, normal people, turn out to be paranoid survivalists who are willing to commit genocide against a race that hasn't actually harmed them in any way. The contrast might have been even more effective if the K'yndarii, instead of looking delicate and graceful (like elves), had had a "monstrous" appearance that belied their peaceful nature. 3. Although the Haalmhad only appear in this one story, the fact that their homeworld was never even mentioned leaves open the possibility that they might actually not be a completely new and different race. Instead, it could be that the Haalmhad are just a ethnic/cultural sub-group of an already-known MU species (just as the pacifist Priests of Pama are a minority group of the warlike Kree race). Since there are so many star-faring alien species who are identical to Caucasian humans in their external appearance, the chances that the Haalmhad could just be a splinter group or "lost tribe" of one of these species seems quite good. Of course, this is only speculation on my part. Aside from my feeling that the Haalmhad are just too human, there are four other elements of the story that I find problematic. 1. How was Star-Lord able to get aboard the Haalmhad homeship? In the story, Ship is telling Star-Lord about her tragic past and then, on the very next page, Star-Lord is shown sneaking aboard the homeship via an emergency airlock. And then, on the next page after that, the homeship command crew are just detecting a contact (Ship) as she approaches at high speed. So how did Star-Lord manage to reach the homeship without being detected? The answer is that Ship turned invisible and brought Star-Lord to the airlock, then left the area and became visible again. The fact that Ship could "appear out of nowhere" was demonstrated in Marvel Preview #11 and her ability to "go invisible" was first shown in Marvel Preview #18. The problem is that someone would have had to have read those stories in order to realize how Ship had gotten Star-Lord to the homeship since no explanation was provided within the story. 2. Why were the Haalmhad so convinced that the K'yndarii alliance with the Ben'yr Federation was a threat to their survival? Were they just REALLY paranoid? This question is not answered. Instead, we're left with a situation in which the crew of a massive starship that is capable of single-handedly destroying planets are somehow terrified of a race that was so peaceful that they never saw the need for a starfleet with which to defend themselves. Clearly, some explanation for exactly why the Halmhad were so afraid would have been very helpful. 3. When did the K'yndarii learn what the Haalmhad were planning to do? The Omniscient Narrative states that "The High Command had known for weeks that the Haalmhad were coming, and they sent every ship they had to stop them." This implies that the High Command knew for some time that the Haalmhad were coming with hostile intent. However, Baku later states that his people welcomed the Haalmhad and thought that they would greet the K'yndarii as friends. This implies that Baku's people were unaware of the Haalmhad's plans until they were close enough to be welcomed. The only way this seems to work is if "weeks" passed between the time when the K'yndarii welcomed the Haalmhad and realized that they weren't friendly and the time when the Haalmhad actually attacked Carillon. The problem is that this would mean that the Haalmhad homeship traveled fairly slowly within the K'yndar system, but this is contradicted by the speed with which they traveled from Carillon to Cymoril. 4. What previous actions had the Haalmhad taken against other planets? The Omniscient Narrative states that the situation with the K'yndarii was "the first time" that the law imposed by the Haalmhad was being challenged. This suggests that the Haalmhad had never before felt that they had to take action against others. However, when they were later confronted by an unknown foe (Ship), it is stated that the Haalmhad wonder if "this is the time they might finally meet their match." This suggests that they have previously been involved in other violent confrontations. I can't account for this discrepancy since there are only two possibilities: Either they had never been challenged before OR they had been challenged before but had prevailed (and therefore had not met their match). I can't see a third option that would reconcile these two statements. Aside from these story problems, the only artistic error I noticed is on the eighteenth page of the story. 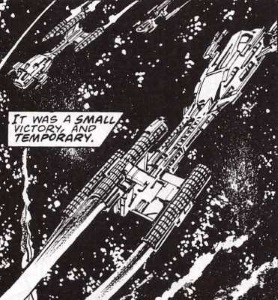 The second panel depicts the Starhawks being launched from the homeship out of their hangars. Unfortunately, both the Starhawks and their hangars are drawn far larger compared to the homeship than they should be. The hangars appear to be about 8 mm wide, compared to the 13.5 cm which is the width of the homsehip. This would make the hangers about 6% as wide as the ship or, based on the previously-calculated width, about 2.3 kilometers wide. Instead, the hangars appear to be no more than twice as wide as the Starhawks (which are about 14 meters in width) which would make the homeship only 467 meters wide. So, clearly the image of the Starhawks taking off is inconsistent with those dimensions which have been calculated for the homeship. As for other errors, the word "hangar" is mispelled as "hanger" throughout the story. Of course, that's only three times in total. or anyone else named "Panshin"
or any other people, places or things whose names begin with the word "Star"
A massive starship which was a hundred kilometers (over 62 miles) in length and massed almost one billion metric tons. Its inhabitants/crew were the Haalmhad, the descendants of the people who had long ago built (or found?) the starship. As the only home of the Haalmhad people, the ship was known as the Haalmhad homeship. The Haalmhad homeship had been in flight for countless generations. It roamed the galactic rim where its people traded with the races of the scattered rim systems, exchanging knowledge and technology for the raw materials they needed to survive. The Haalmhad also used the power of their homeship to impose their ideas of law upon these races. Although the homeship was capable of faster-than-light travel between star systems, the exact method of propulsion has not been revealed (but may have involved travelling through warp-space via some sort of hyperdrive). Travel within a star system was much slower but they could still travel from K'yndar III to K'yndar IV is less than two days (local time). Forward thrust seems to have been provided by three giant rocket engines located at the rear of the homeship. The propellant used by these rockets has not been identified. The homeship was powered by matter/anti-matter reactors which somehow generated energy (presumably through the mutual annihilation of particles). The source of the fuel (especially the anti-matter) used by these reactors has not been revealed. The homeship was extremely well-armed. Aside from its fleet of Starhawks, smaller craft capable of carrying enough weapons to render a planet's surface uninhabitable within a day, the homeship itself was armed with many multi-tiered turrets that were situated "all across" the starship. Each turret could fire a huge energy beam and, when properly targeted, a single salvo from multiple turrets could be enough to blast a planet into rubble. The Haalmhad homeship was equipped with shields which could protect it against physical or energy attacks. Non-physical in nature, these shields were force fields that were generated by mechanisms within the homeship. Although generally used against outside threats, the main screens could be focused within the homeship so as to surround a particular section (like Hangar 1) and contain anything within it. However, the defensive systems could be sabotaged in such a way that trying to activate the shields at full power would result in all that power being channelled through the ship's entire power grid, causing overloads that could burn out every system and power line in the ship. Despite its size, the homeship lacked sufficient mass to curve spacetime enough to naturally create a gravitational field around itself. Additionally, any such natural field would have acted to draw everything towards a central point. Thus, it must be assumed that the Haalmhad homeship was capable of generating some sort of artificial gravity throughout itself. Areas of the homeship that were named included the Bridge, Damage Control, Computer Central/Computer Control, Engineering, Hangar 1, Security Control, and the Weapons Deck. Other areas that were seen but not named included a hall used for the ship-wide debates, a Starhawk maintenance bay, a farm area (with livestock that looked like chickens, a pig, a cow and a horse), and a private dining room where a family was served dinner by a robot. There was also a shipwide network of telephone/computer terminals which could be accessed via one's credit card, and a number of emergency airlocks. Note: What happened to the homeship after Ship towed it to the planet where the Haalmhad were to be quarantined has not been revealed. It may have been left in orbit while its occupants shuttled down to their new home or Star-Lord may have had Ship deposit it on the planet so that the Haalmhad could break it up as salvage. Commander Caine was the leader of the warriors aboard the Haalmhad homeship. Although decisions about policy were made by the Haalmhad community as a whole, Caine was responsible for implementing those policies and, if military action was deemed necessary, then Caine had operational command. It is unclear if Caine commanded the homeship during its normal day-to-day operations. After learning that the K'yndarii race had allied themselves with the Ben'yr Federation, the Haalmhad community decided, by a majority vote, that the K'yndarii had become dangerous and that the threat they now posed to the survival of the Haalmhad was to be eliminated by wiping out the entire K'yndarii race. Accordingly, the destruction of the two planets inhabited by the K'yndarii was authorized. 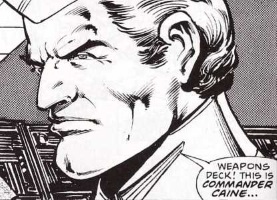 Commander Caine was presumably involved in the planning of all phases of this operation. Command Caine was in overall charge of the Haalmhad forces when their Starhawk fighter craft wiped out all of the ships defending Carillon, when the first assault wave was taken by surprise and cut to pieces by Carillon's massed batteries of laser cannon, and when the Starhawks then used lasers, tactical fission nukes and strategic fusion bombs to destroy all military bases and cities on Carillon. On the homeship's bridge, Caine received a final evaluation which stated that Carillon had been reduced to "a radioactive dust-ball (that was) instant death to any life as (they knew) it for at least the foreseeable future." Caine then expressed his view that, as long as the planet itself existed, its resources could still be used against them, and so he gave the order to the Weapons Deck to open fire on their target coordinates. The resulting single salvo of huge energy beams cut deeply enough into Carillon's crust to release the planet's internal forces, causing Carillon to explode into rubble. While the homeship on course to Cymoril to carry out the final phase of the operation to eliminate the K'yndarii threat, Caine was advised that sensors had detected a vessel of unknown configuration which was refusing to answer the homeship's hails and was closing fast on an intercept course. Caine ordered that battle stations be sounded and that a full flight of Starhawks be launched to deal with the unknown foe. When they proved ineffective, the homeship's main batteries began to fire as well. Later, after the alien vessel had surrendered, Caine received a report from Hangar 1 that the alien ship was inboard and secure and he thanked the captain making the report. However, when Security Control reported that the alien intruder was still on the loose, Caine replied that he was not interested in the colonel's excuses, he wanted that alien found! Later, after receiving a report that the temperature in Hangar 1 was still climbing and that its ceramic-steel bulkheads couldn't hold much longer, Caine ordered Harli to focus the homeship's main screens around Hangar 1 and to put the full output of the matter/anti-matter reactors behind them. Despite a desperate effort by Verdi in Computer Control to countermand them, these orders were carried out and the shields were activated. Instantly, the sabotage performed by the alien upon the homeship's defensive systems began to manifest itself as, one by one, every system and power line in the entire power grid began to overload and burn out, eventually leaving the entire ship dark. After seconds of darkness, the emergency lights came on, and Caine demanded a report but the officer was unable to comply since his board was nonfunctional, part of a failure that ran through the entire ship. When a voice from the darkness said that they were all as you as dead, Caine demanded to know who was there, and the alien sitting in a command chair stated that he was their conscience or their executioner. Identifying himself as Star-Lord, the alien claimed responisibility for what had happened to the homeship and and went on to say that the K'yndar had offered them friendship but the Haalmhad had chosen to destroy the K'yndar and now they had no choice. Star-Lord then revealed that there was a primitive but livable Type-M planet in a G-3 star system about twenty parsecs away and that, if they were careful, their emergency life support systems would last the time it would take for his ship to tow them there. When Caine asked if he meant to maroon them there, Star-Lord corrected him, stating that it was a quarantine and that at least there they would have a chance for survival, more than they had given the people of Carillon and more than they had in their present situation. Doctor Panshin was a doctor aboard the Haalmhad homeship. He seemed to be the leader of those in the Haalmhad community who were opposed to the idea of committing genocide against potential threats. What his attitude was towards actual threats has not been revealed. After the homeship destroyed the planet Carillon in the inital phase of their operation against the K'yndarii race, the ship-wide debate resumed as the homeship made its way towards Cymoril. The officer representing the majority viewpoint argued that the K'yndarii had become dangerous when they allied with the Ben'yr Federation and that that danger had to be eliminated. Doctor Panshin replied: "What danger?! They've done nothing to us! Are we so spiritually bankrupt that we must become the greatest mass murderers in galactic history because of a threat which may not even exist!?!" Panshin was then interrupted by his opponent who stated that he had heard enough. Although he expressed his respect for Dr. Panshin and his views, the officer reminded him that a community decision had been made before they had "neutralized" K'yndar IV. When asked if he had sufficient support to overturn that vote, Panshin quietly said, "No." The officer stated that further debate was then pointless and that the final phase of the operation would proceed as scheduled, to which Doctor Panshin quietly replied, "And may God have mercy on all our souls." 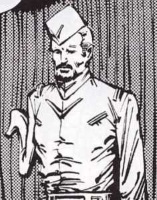 Doctor Panshin's most visible distinguishing feature is the fact that the right sleeve of his uniform is pinned up, indicating the absence of his right arm. How and why he lost his arm have not been revealed so it may have been a birth defect or the result of an accident, a medical condition or a combat injury. The latter possibility might have contributed to Panshin's current non-genocidal attitude. Bret is a male Haalmhad crewman who was stationed in Hangar 1 of the homeship. After the alien attacker (Ship) had surrendered and was taken into Hangar 1, the captain in charge of Hangar 1 reported to the Bridge that the alien ship was inboard and secure. Various crewmen were then set to work attaching sensor leads to the hull of the vessel. One of them remarked on the fire alarm, stating that he was happy as long as it wasn't there in the hangar. Seconds later, the alien intruder (Star-Lord) was spotted up on the balcony, but he made it into Ship before he could be stopped. Once Star-Lord was aboard, Ship issued a warning that everyone had one minute to evacuate the hangar or they might be harmed. When a crewman called out to Bret that the ship was glowing, he vehemently responded that it was getting hot! Bret then ordered all the crewmen out at "full thrust" and told Korda to use the emergency controls to blow the hangar bay doors and void "that hellship" before they were fried. Seconds later, after Korda reported that the control panel had been wrecked and all the control systems were inoperative, Bret asked Jarl for a reading of the temperature in the hangar and was told that it was "A thousand Centigrade, and climbing" and that the alien ship was becoming a small star. Soon afterwards, Star-Lord and Ship's plan to trick the Haalmhad into unwittingly imobilizing their homeship succeeded, and Ship stopped the controlled matter-to-energy conversion she was using to generate the heat. Note: Bret had a "take charge" attitude which could indicate that he was the captain in charge of Hangar 1 but this is only speculation on my part. 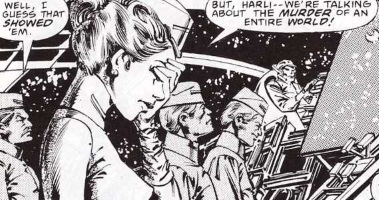 After witnessing the destruction of the planet Carillon, these two members of the Haalmhad homeship's bridge crew reacted in two very different ways. Harli, the male officer with the mustache at the far left, stated, "Well, I guess that showed 'em." Cass, the female officer covering her eyes with her hand replied, "But, Harli - - We're talking about the murder of an entire world!" Another officer tried to reassure her by saying, "We only did what we had to do, Cass." Later, when Ship was heating up Hangar 1, Harli was ordered by Commander Caine to focus the main screens around Hangar 1 and to put the full output of the matter/anti-matter reactors behind them. Harli obeyed, and things did not turn out well for the Haalmhad. Jahl is a male Haalmhad crewman who was stationed in the Computer Control section of the homeship. He was one of the crew who calibrated target coordinates on the planets targeted by the homeship's main energy weapons. As Verdi was reminding his crew that the commander wanted target coordinates on K'yndar III that would cause maximum destructive impact with minimum energy expenditure, he noticed that Jahl seemed distracted and asked if he was listening. Jahl responded by alerting Verdi to the fact that the wall of Computer Central was melting. Seconds later, an alien intruder (Star-Lord) stepped through the newly-melted hole, held the crew at gunpoint and ordered them to put their hands where he could see them and move into a corner. As he input a program into the homeship's computer system, Star-Lord was jumped from behind by another Haalmhad (who had come through the hole after him) and he used his Element Gun to slag the computers as a distraction. The tactic worked and the crew became occupied with fighting the "major" fire as it started to spread. Jahl was presumably among those who fought the fire. Jarl is a male Haalmhad crewman who was stationed in Hangar 1 of the homeship. After the alien attacker (Ship) which had surrendered and been taken into Hangar 1 began to generate intense heat, all crewmen were ordered to evacuate the chamber. When Bret learned that they would be unable top blow the hangar bay doors in order to void the ship, he asked Jarl for a reading of the temperature in the hangar. Jarl had this response: "A thousand Centigrade, and climbing. It's incredible, Bret - - a controlled matter-to-energy conversion. Before our eyes, that ship's becoming a small star." Soon afterwards, Star-Lord and Ship's plan to trick the Haalmhad into unwittingly immobilizing their homeship succeeded, and Ship stopped the controlled matter-to-energy conversion she was using to generate the heat. Note: Since only the back of Jarl's head was depicted, I have chosen to not include that image in this sub-profile. Korda is a male Haalmhad who was stationed in Hangar 1 of the homeship. After the alien attacker (Ship) which had surrendered and been taken into Hangar 1 began to generate intense heat, all crewmen were ordered to evacuate the chamber. Korda was told by Bret to "hit" the emergency controls and use them to blow the hangar bay doors in order to void "that hellship" before they fried. However, Korda discovered (and reported) that someone had wrecked the panel, leaving the main and back-up systems inoperative, and that even manual control was out. Someone (possibly Bret) then realized that that was what the alien intruder was doing up on the balcony. This major was definitely the female bridge officer who delivered the final evaluation to Commander Caine. She reported that Carillon was "now a radioactive dust-ball, instant death to any life as (the Haalmhad knew) it for at least the foreseeable future." However, Caine felt that the resources of Carillon, even in that state, could still be used against them so he had the Weapons Deck fire massive energy beams that shattered the battered world into rubble. An officer aboard the Haalmhad homeship who was ambushed from behind by an alien intruder (Star-Lord) while walking down a corridor in one of the ship's extremities. Major Stanchek was knocked unconscious by a single blow by Star-Lord who then stole his uniform (to serve as camouflage) as well as his identification. Star-Lord then hid Stanchek's unconscious body and infiltrated deeper into the homeship, eventually using the major's credit card to use a telephone/computer terminal to show him the best route to the engineering section. However, using that credit card proved to be a mistake as Star-Lord hadn't hidden Stanchek's body well enough and he had quickly been found by security. Once they knew the alien's assumed identity, it was easy for the Security Comps to track him down. Of course, capturing Star-Lord proved to be much less easy. The smaller fighter spacecraft used by the Haalmhad as the first line of defense and offense against targets that are deemed to be a threat to the homeship. They are (presumably) short-range spacecraft that are incapable of interstellar travel, and it has not been revealed if they are capable of landing on planetary surfaces (or anywhere except in the homeship's hangar bays). Starhawks are capable of both atmospheric and space combat, and can carry out air-to-ground bombardments on targets on planetary surfaces. Their weapons include lasers, missiles, fission nuclear bombs and fusion bombs. Each Starhawk has three distinct sections: the command section, the drive section and the boom (or neck or superstructure) that connects them. Their exact specifications have never been revealed but, based on these images, they can be VERY roughly estimated to be 40 feet wide by 90 feet long. The command module appears to be about 30 feet long and to be composed of two layers. The lower layer's hull is about 21 feet wide but the weapons (lasers) mounted on both sides increases that total width to 40 feet. The upper layer is about 12 feet wide and appears to be a cockpit with two forward-facing rectangular windows. Based on its size, each Starhawk presumably has a fairly small crew complement of (probably) no more than six. The flight crew might include a pilot, a co-pilot, a flight engineer, a sensor/communications operator, and a weapons system officer but, depending on how automated the control systems for the Starhawks are, fewer personnel may be needed. The middle section is about 10 feet wide by 30 feet long, and does not appear to be wide enough to hold anything wider than a single corridor. It's possible that its main purpose to maintain a minimum distance between the command module and the drive section. Additionally, it seems likely that this is the part of the Starhawks from which their missiles and bombs are launched/dropped. The drive section appears to be somewhat less than 30 feet long. 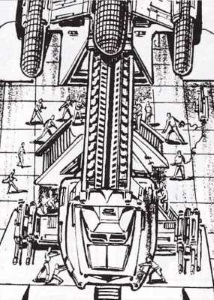 It seems to consist of a core that is no wider than the middle section to which three pylons are attached, each of which connects the Starhawk to one of its three cylindrical rocket engines. While the two lower pylons project out to each side less than 45 degrees below the horizontal and are connected to their rockets along half of their length, the third pylon is mounted vertically and its connection to its rocket is only a fifth of its length. Since no means of providing reverse thrust are immediately apparent, it's likely that the rockets can produce thrust from either end. This would account for why the drie section is kept at a distance from the command module. The propellant used by these rockets has not been identified nor is it known where on the Starhawk it is stored. The energy source which powers each Starhawk has not been revealed but it may be a smaller version of the matter/anti-matter reactors which power the homeship. Alternatively, each Starhawk may be powered by batteries which are periodically charged up by the homeship. Similarly, the propellant used by the Starhawks' rockets has not been identified nor is it known where on the Starhawks it is stored. 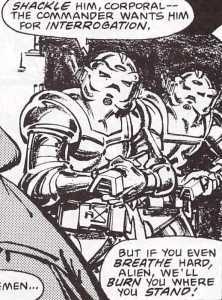 During the Haalmhad attack on the planet Carillon, an unspecified number of Starhawks were deployed against the ships that Carillon High Command had sent up to stop them. The Starhawks proved to be vastly superior to the defenders and the resulting battle was a massacre. Only hours later, once local planetary vectors were under their control, the Starhawks were sent against ground-based targets but were taken by surprise when massed batteries of laser cannon cut their first assault wave to pieces. However, the surviving Starhawks learned from their mistake and began to use their lasers, tactical fission nukes and strategic fusion bombs to neutralize all of the military ground bases one by one. Then, once all the military targets had been destroyed, the Starhawks began using their weapons on Carillon's now-undefended cities. Within a day most of the planet's population had been killed off. Once their mission had been accomplished, the Starhawks returned to the homeship whose main batteries then fired a single salvo of huge energy beams which shatteered the planet's crust, causing it to explode. Later, while en route to the planet Cymoril to carry out the final phase of the destruction of the K'yndarii race, the homeship detected an unidentified contact (Ship) which the Haalmhad considered a possible threat. Commander Caine sounded battle stations and a full flight of Starhawks was launched against the unknown foe. However, Ship was able to easily evade both their missiles and energy cannon, and steadily approach the homsehip which began to fire its main batteries. Eventually, although not having been damaged, Ship surrendered and was secured in Hangar 1. The total number of Starhawks that were based aboard the homeship has never been revealed. The number of Starhawks that were destroyed during the first assault against Carillon's ground bases is also unknown. The security forces aboard the Haalmhad homeship were combat troopers who wore full battle armor. They were also known as "steelbacks" because of their armor. The troopers were armed with blasters which could kill a person or burn through a (steel) hatch (if given enough time). The troopers were also equipped with "infra-red homers" (which could be either sensors in their helmets or ammunition that tracked targets using their infra-red heat signature). When the alien intruder (Star-Lord) first spotted a squad of the combat troopers, he thought to himself, "The less I see of these bozos, the better." Unfortunately, his hopes were dashed when he was soon confronted by at least four of the armored troopers after the security comps had tracked his assumed identity. As a corporal was ordered to shackle the alien while the others held him at blaster-point, Star-Lord struck first, finding the armor to be "tougher than it looked." Although he had been expecting trouble, just "not quite so much, or so soon," Star-Lord found that the number of troopers and the close quarters in which they were fighting worked to his advantage as the troopers were tripping over each other's feet and they couldn't use their blasters without hitting each other. Soon enough, Star-Lord had managed to knock all four troopers out and then escaped to his target, the homeship's circuitry systems control room, before reinforcements arrived. Once the alien intruder had blasted that room's electronic lock, the hatch was sealed and the troopers had to burn through it carefully so as to avoid damaging any of the components in that room. However, the Steelbacks were determined and when they did burn through the door their leader ordered them to not fire unless they had a clear target and then they were to shoot to kill. However, Star-Lord evaded them (again) by blasting an overhead coolant pipe, releasing liquid helium which interacted with the air to create a dense fog of ice crystals. The alien was gone by the time they had shifted to infra-red homers. Soon afterwards, when Commander Caine called from the bridge to ask for the status of the intruder, the colonel in charge of Security Control had to report that he was still on the loose even though they had thought they had had him in Engineering. Caine was not interested in the colonel's excuses - he wanted the alien found! A male Haalmhad officer who was in charge of the computers that ran the homeship. His section was known as both Computer Central and Computer Control. Among other duties, Verdi and his crew were in charge of calibrating target coordinates which were then used by the crew on the Weapons Deck. Following the destruction of Carillon, as the homeship was on course for its next genocidal attack, Verdi told his crew to get back to work calibrating target coordinates on K'yndar III. As he was reminding them that the commander wanted maximum destructive impact with minimum energy expenditure, Verdi paused to ask Jahl if he was listening and Jahl responded by pointing out that the wall of Computer Central was melting. Seconds later, an alien intruder (Star-Lord) stepped through the newly-melted hole, held the crew at gunpoint and ordered them to put their hands where he could see them and move into a corner. As he input a program into the homeship's computer system, Star-Lord was jumped from behind by another Haalmhad (who had come through the hole after him) and he used his Element Gun to slag the computers as a distraction. The tactic worked and the crew started to fight the fire, with one crewmen calling out to Verdi for more extinguishers because the fire was spreading. At the same time, someone (possibly Verdi) contacted Damage Control to report a major fire in Computer Central and called for men and equipment to be sent at "full thrust." Later, after the alien vessel (Ship) which had surrendered and been taken into Hangar 1 began to generate intense heat, Commander Caine ordered that the main screens be focused around Hangar 1 and that the full output of the matter/anti-matter reactors be put behind them. 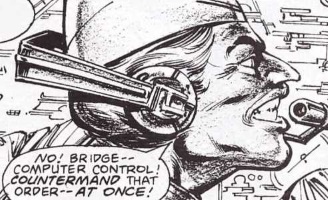 When one of his crew informed him that the commander had called for "overload levels" on the shields, Verdi reacted with alarm and immediately contacted the Bridge to countermand that order, explaining that the alien had sabotaged their defensive systems. However, his warning of what would happen if they activated the shields came too late as the shields had already been activated. One after another, every system in Computer Control overloaded and burnt out, with blue-white flame searing across the faces of every console and the air filling with acrid smoke. Soon, the homeship's entire power grid had failed, leaving the entire ship in the dark until the emergency lights came on.